Boogie's getting a little musty and fuzzy. He's due for a bath and haircut next week, so he'll look much more handsome when you see him next. But he's still a big cutie. WHERE IS HIS OTHER EYEBALL?! SOMEONE STOLE HIS OTHER EYEBALL! Now you know why he needs a hair cut. 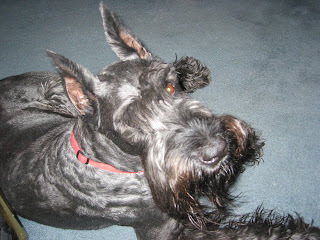 And yes, gentle readers, Boogie's Grandma does spoil him, and bring him carob treats, and thinks he can do no wrong. A typical Grandma/Granddog relationship, actually.